Having experienced the Segway city tour in Rome, we couldn’t wait to ride the Segway again – the feeling of gliding freely along paths and visiting many attractions easily without breaking a sweat and thanks to Gogreen Segway, we had the opportunity to experience this ride right here in Sentosa, Singapore. 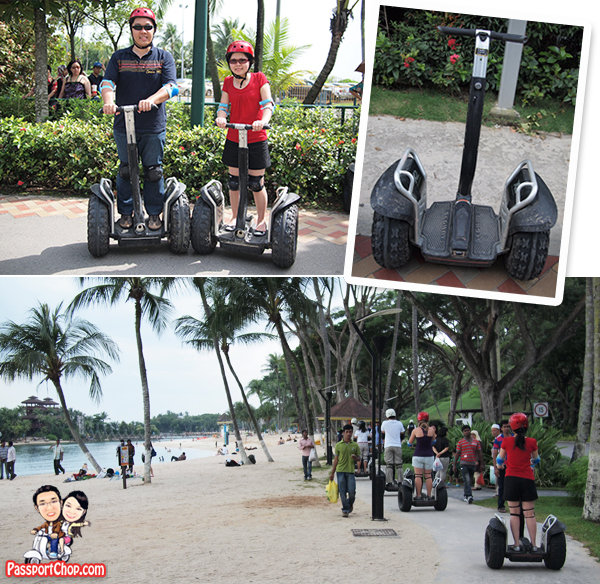 There are 2 different ways you can experience a Segway ride at Sentosa. If you haven’t tried the Segway® Personal Transporter (PT) before, you can learn to balance and ride it in the fun and safe environment of the Gogreen circuit through the Fun Ride ($12 for one round). Once you have gotten the hang of it, you are free to explore the circuit. 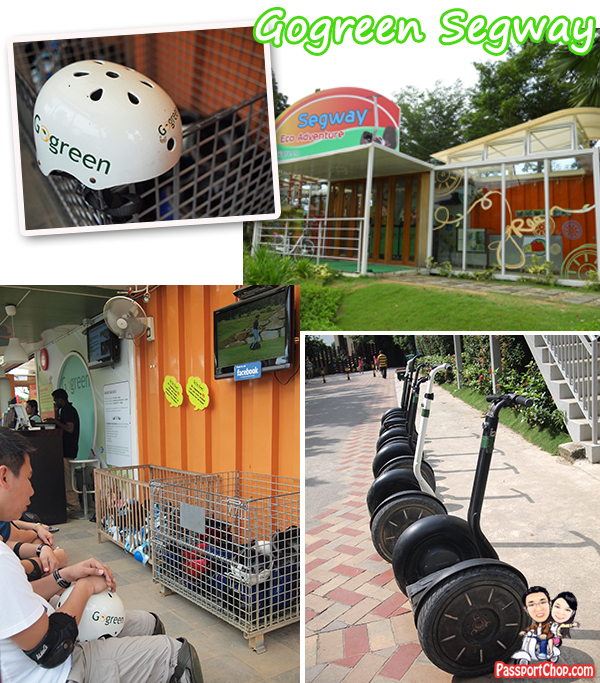 The Gogreen Circuit consists of a training ground and an interesting trail of twists, turns and inclined slopes guaranteed to make your Segway® fun ride experience truly exhilarating! If you want to give it a go again, simply top up $5 for another round in the Gogreen circuit. With our Rome Segway experience, we were confident enough to go straight to the Guided Eco Adventure ($38/person). The tour leaves every half an hour and there were ample time for us to get fitted with all the safety pads for our elbows and knees and helmet. The safety video on the usage of the Segway PT is also shown in the waiting area – if you are unfamiliar with its operations, this video provides a quick overview with important tips e.g. how to get off the Segway PT properly and how to know when it is safe to operate it. The 30-minute Guided Eco Adventure brought us to Tanjong Beach before turning back to the starting point of the tour. The route is quite straightforward – no major obstacles and where there were vehicles or trams, the marshals (2 of them) would zoom right in front to hold them up so that our entourage of 10 Segway riders could move out of the potential danger zone. While not as exciting as the earlier 3-hour Segway experience we had in Rome (more tourist sights and road crossings), this Segway Guided Eco Adventure is definitely a good and safe start for people new to Segway rides. For a fraction of those city Segway rides (which typically cost about S$100-150), you will get a taste of what’s it like to operate the Segway PT and whether you enjoy the experience well enough for an extended city tour (usually 2-3 hours long). One way this Segway Guided Eco Adventure tour around Tanjong Beach could be made more interesting would be either through portable media players or having the marshals/guides explain the history (if any) or any interesting trivia of the beach along the route. reaaly great.I quote some of the content here hope you don’t mind lol!! I am sorry that you guys were unable visit MegaZip that day, but please know that you are always welcome to come back at any time during our opening hours to experience what we have to offer. Our website http://www.megazip.com.sg also offers a lot of useful information on our latest promotions and discounts. Hope to see you soon at our park for some fun, excitement and the adrenaline rush of your lifetime! STB should consider engaging you as our Singapore Ambassador to promote Singapore.